Wield more power with our range-leading 7×19 stainless steel rope that measures 16mm in diameter. 16mm 7×19 Stainless Steel Wire Rope offers increased load-bearing capacity and strength than its stable mates while still sticking to the principles of flexibility offered by the entire line up. Certain stainless steel rope constructions are more malleable than others. 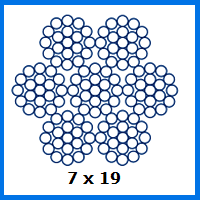 In the case of the 7×19 configuration of strands, you get a particularly high amount of flex when considered alongside a 1×19 alternative, for example. The 14,831kg WLL of this particular wire rope is the greatest available in this construction. Its 145.5kN breaking force is also noteworthy, as it outdoes every other 7×19 rope we produce. From control cable replacement to marine rigging deployment, rope like this will serve effectively in many scenarios. However much wire rope you want to order from Rope Services Direct, remember that you can also add various customisations and components in alongside it. This might constitute a handful of fittings, or involve requesting a bespoke assembly put together by our experienced engineering team. We can make slings using this stainless steel rope which will be weather-resistant and attractive. Other assemblies are available on request and each one will be made to measure. Secure the assistance of an RSD specialist by visiting our contact page to send an email or calling our sales hotline on 01384 78004. Each query will be treated with the same care and attention by people who know what they are talking about. 16mm 7x19 Stainless Steel Wire Rope Overall rating: 5 out of 5 based on 6 reviews.